1/3 scale V10 RC car. Finally got round to starting a new thread for the car I'm making. I decided I want the V10 to power something rather than sit on a stand. As usual with my projects it's gone into fantasy land with the specification, but I think most of it should be do-able. 1/3 scale radio controlled hybrid car/off road buggy. 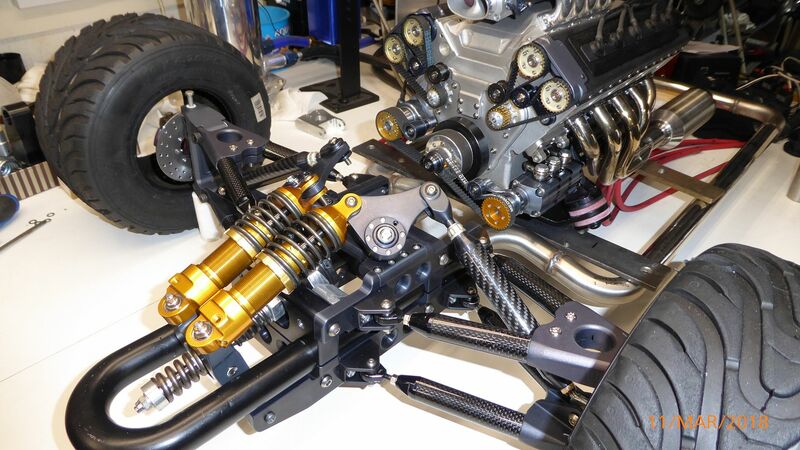 125cc V10 fuel injected petrol engine. 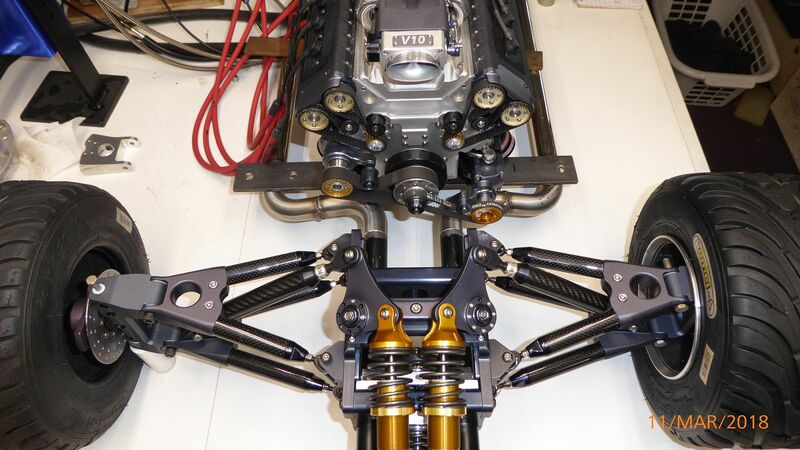 Pushrod suspension, carbon wishbones and struts, titanium fasteners. Hydraulic disc brakes all round, magnesium wheels. 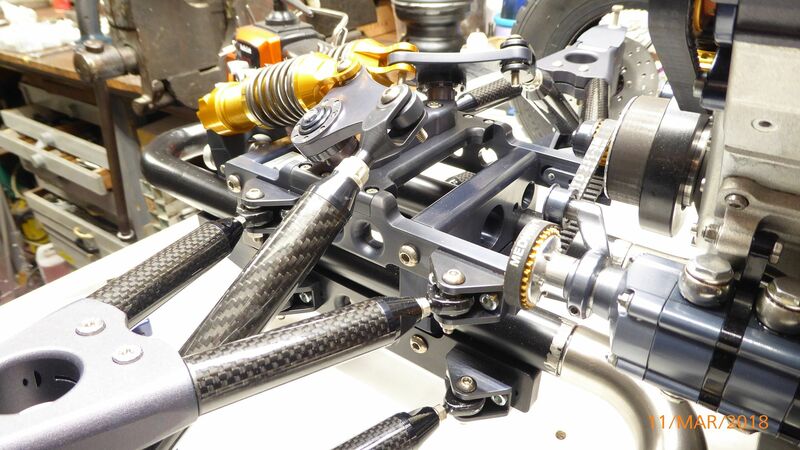 Centrifugal clutch, carbon fibre propshaft. 5 speed transaxle, with limited slip differential. Not thought about the bodystyle yet. I want to use lightweight materials where possible because, A, it's fun, and B, I estimated the weight at 40kgs, which is ridiculous, so it's ally, carbon fibre and titanium wherever practical (affordable). 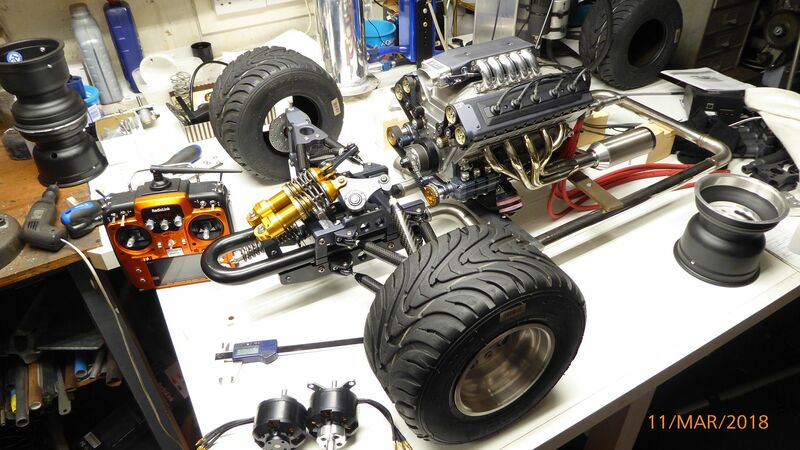 I'll put some more pics up when I know this post works ok.
Re: 1/3 scale V10 RC car. The front suspension isn't finished, I just mocked it up today to check ride heights etc. 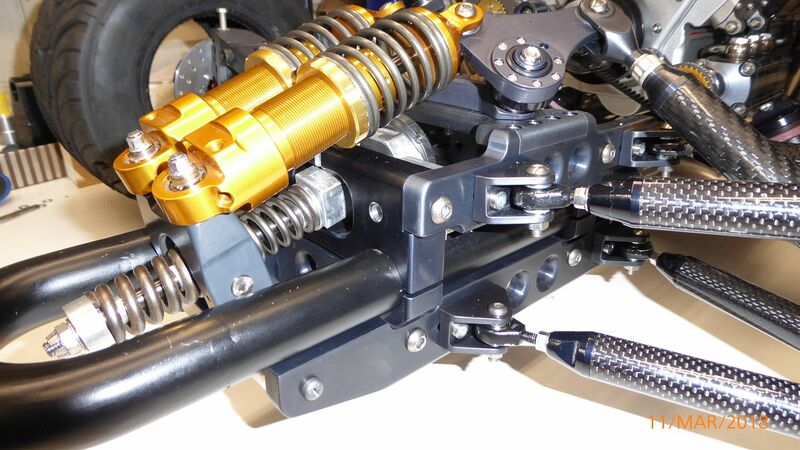 The shock absorber mounting Spring thing is the anti-roll system, which seems to work ok, and it has the benefit of also being the variable ride height system, by pulling the spring rod in and out. If that makes any sense. Still early stages, I reckon it's a 2 year project, unless I can retire in the meantime. Any other specification suggestions welcome at this stage. I want this to be the best RC car ever. I have 10 channel radio gear available. The shocks will need external reservoirs. I would like to make them nitrogen pressurised but haven't investigated that yet. That looks incredible - going to be a fun one! One thing on your specs is confusing me though - lists both a V10 petrol engine and 2 brushless electric motors - is this a hybrid? Worlds fastest Prius? Yes, from the start wanted to get an electric motor in it somewhere so I can easily drive it around for testing the chassis and steering, etc. without having the hassle of running the engine. But then I thought it would be cool to make it a proper hybrid with 5hp of electric motors. Should get some nice wheelspin from it anyway. It's rear wheel drive only by the way. That looks like some full size race car engineering but I know it is a 1/3 scale model. We need something to gauge the size of the car by. What is the outside diameter and width of the tyres (tires) and the length and width of the whole thing? Yes, good point. I'll sort something out, cheers. Tyres are 10" diameter go kart wets. Don't the original Mini's use 10 inch tires? As we say in Georgia, day-um! That centrifugal clutch - if it's of any interest I have a set of equations (and a half completed spreadsheet which implements them) to design a schluter-type solid clutch to transmit a given torque biting at a given RPM. I'm talking about the sort of clutch which is like an ordinary 2-shoe clutch but instead of being a made-up item with hinged shoes and springs the rotor is a solid metal disk with two holes and two slots to form self-sprung shoes (see attached sketch) for better strength and vastly improved reliability. The rotor operates inside a close-fitting bell and the friction lining is bonded to the inside of the shell rather than the shoes (much better cooling, stronger etc). I did it for RC helicopters many years ago, but never finished the "tidied up" spreadsheet. If it would be of any value to you I would be proud to finish off the spreadsheet for you. Just say the word. Thanks Allen, I remember that type of clutch from my helicopter days. It is very simple and reliable, but I want to go with something a bit more tuneable, ie. I want to be able to change springs and spring preload etc. I would also like to be able to disengage the shoes somehow so I can rev the engine all the way up without engaging the clutch. Not sure how yet, but something will come to mind eventually. Sorry for late reply, I assumed this thread was dead. It's your thread Keith. It's dead when you say it's dead. We're all patiently waiting for your next installment. Please keep us updated on this fascinating project! How is the car going? I am new here and I have just read the V10 engine thread. I was absolutely enthralled. Please keep up the good work and let us know what you are doing from time to time. I live in Northampton, England. I do RC helicopters and planes. I used to race off road 1/10 scale buggies. An engineer at heart but not in practice, yet. Yes, it's going ok. I was getting impatient with the engine so stuck a couple of electric motors on, so I could drive it a bit. But the electric motors I've got aren't really suited, so I'm getting the V10 working at the moment, with a centrifugal clutch. Hardest bit will be making the transaxle. It will be 3 speed, with adjustable lsd, and seperate inputs for the electric motors.